My last post was on how to avoid dangerous substances. HOW TO AVOID DANGEROUS SUBSTANCES: For ‘a healthier you’! If you suffer from food allergies, TILT, EI, MCS, depression, migraines or other skewed body response physically, emotionally, mentally or spiritually; my last post is a must read. 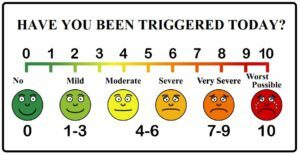 On a daily basis many people are triggered regularly by numerous triggers. Believe it or not the triggers can be anything. Your equivalent ‘little black box’ records real and perceived threats and history about many factors that have harmed you in the past. In present day your body may mount a ‘skewed’ or abnormal response to similar triggers, real or perceived – leading to unwanted symptoms on any level. Some triggers present physical symptoms while others may affect thinking, memory or brain chemistry. Some triggers send people into ballistic emotional responses. You may know people who are affected by changes in barometric pressure, experiencing migraines or joint pain or others who are affected by the full moon. Why is every person not affected by changes in barometric pressure? Sometimes, when I think about how sick I was in the past, it seems like another life or a dream. It was a nightmare that never seemed to end. I have my health back after environmental illness (EI), toxicant induced loss of tolerance (TILT), multiple chemical sensitivities (MCS) and depression – all triggered by moving into a new home. It took me years of doctor’s visits and trial and error to restore my health. I feel good on a daily basis and safe in all my environments. That does not mean that all environments are safe for everyone. Most of my trial and error attempts to regain my health were natural as traditional medicine was not able to help me. For those out there who are still suffering, do not give up. The biggest change in my recovery came when I completed the botanical spa therapy detoxification. I had tried countless ingest-able detoxification products and never experienced the gains that I realized from the botanical spa therapy detoxification baths. I designed the botanical spa therapy recipe using my knowledge of the medicinal properties of botanical plants, learned through my studies. This is the one main natural strategies that has had the biggest impact in regaining my health and I see the same gains in my clients. I have had clients who have had chronic back pain for years who are now pain free as the result of completing the botanical spa therapy. 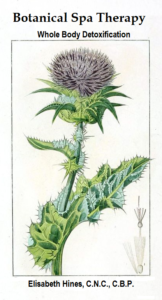 If you have any type of chronic symptoms or conditions consider botanical spa therapy. You can find my Botanical Spa Therapy whole body detoxification recipe and instructions in my book THE WHOLE PERSON WELL-BEING EQUATION. ENJOY better health starting today! MY HEALTH RECOVERY: The butterfly effect is the belief that small changes over time can create huge life changes. When I am not busy with my other life responsibilities I like to use the creative side of my brain to keep it active. I painted this saying on an old picture from a thrift shop. I hope that it inspires you to belief and expect that more is possible in terms of your health. Creativity has always been ‘health giving’ for me and research provides evidence of the benefit. Using the creative side of my brain has helped me through many challenging chapters. 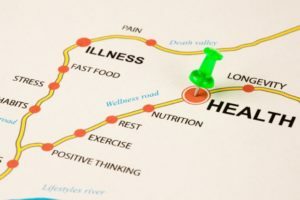 My recovery from multiple health challenges (environmental illness – EI, toxicant induced loss of tolerance – TILT, multiple chemical sensitivities – MCS, chronic fatigue – CF, severe gastrointestinal distress, irritable bowel – IB, stress sensitization, major depression, spasmodic dysphonia – SD; has taken a long time. The good news is that I now have good health, feel good and I can live and function in the real world and work, generating income. My recovery path took many small changes over time and the resulting end product – good health, still amazes me at times; especially when I see other people still struggling with diagnoses that they were given decades ago. Like many people who have suffered for years, I sought the ‘ultimate cure’ like many people do. In the end it was the small incremental changes and improvements that added up to a sustainable recovery for me, and my clients, providing the ultimate cure. After years of struggling with compromised health, a byproduct of my many life challenges over time, it was delusional of me to think there would be one ultimate cure. 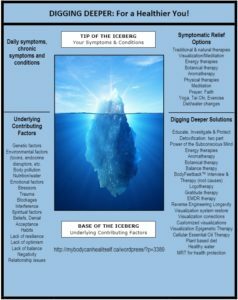 Although symptom relief strategies are required to address ‘the tip of the iceberg’ factors so that one can function on a daily basis; it is the addressing and resolution of the ‘base of the iceberg’ factors that will provide sustainable recovery for your health challenges. Your health recovery journey will have many setbacks and backward trends, all possible detours along the way. I had many set backs on my well-being journey and still do at times. Do not give up! Expect the detours that come and take them; getting back onto the road to your recovery. Remember, ‘the butterfly effect is the belief that small changes over time can create huge life changes’. Make a change today! More is possible in terms of your health, and possible is ‘doable by you’, with the right guidance. Where do you start to reap the same benefits that I have? 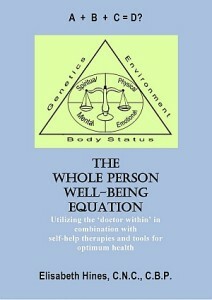 Use my holistic protocol found in my book, The Whole Person Well-being Equation. Green your healthcare using essential oil therapy and me as your guide. 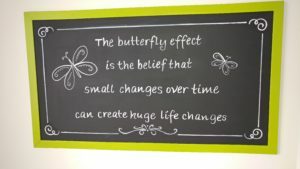 Read more in my post at http://mybodycanhealitself.ca/wordpress/?p=1380. I offer the experience of results as a holistic wellness practitioner from many clients who have recovered from their health challenges. Wishing you healthy longevity; it is available to you! Sometimes I forget how ill I really was. A blessing for sure! I am revisiting my multiple chemical sensitivities (MCS), toxicant induced loss of tolerance (TILT), environmental illness (EI), chronic fatigue (CF), multiple food allergies, irritable bowel, depression, seasonal affected disorder (SAD), stress sensitization and spasmodic dysphonia past diagnoses today. I am often reminded about how severely ill and affected I was by these conditions when I get inquires from all over the world asking for help from those still suffering. All of the preceding diagnoses (plus more) were given to me in the past. I suffered severely for many years and I now have good health and feel good. I can eat all foods and feel save in many environments, avoiding toxic environments as everyone should. On my journey to good health I tried many strategies, always looking for ‘the cure’. Like many people I read every article about the latest supplement and cures and spent a lot of money on trying them. From today’s view point it is clear to see that one cannot regain their health by merely supplementing/adding on something; one must start at the very beginning. 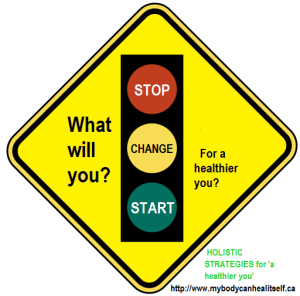 Regaining health requires implementation of a series of ‘stop, start and change’ strategies. The biggest challenge, in ‘hind sight’ and from the successes of my clients has been knowing ‘what do you stop, start and change‘. That’s were my road map can help you. As a holistic wellness practitioner I share my variety of holistic strategies with my clients, on my website, in my blog posts and through more detailed guidance in my book, e-books and consultations. 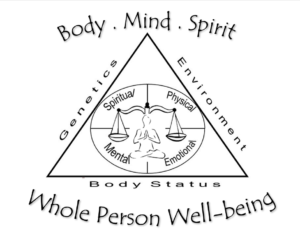 My book THE WHOLE PERSON WELL-BEING EQUATION is the holistic protocol or road map where I share the ‘stop, start and change’ strategies that helped me to recover from my conditions. The cure for what ails you starts with your personalized ‘stop, start and change’ protocol. Contact me to get you started on your holistic protocol. You can also find this information in my book. I offer holistic retreats at my location for people who travel from afar seeking health recovery from these and other conditions. Regardless of your condition, the first step to recovery is a personalized ‘stop, start and change’ protocol. When I first started my website I was challenged to pick a website address and a page title that reflected my philosophy, belief and hopes despite the fact that I was still suffering from many of the diagnoses. Now many years later I know it was the right pick because ‘my body can and did heal itself’ with help from a variety of natural strategies and therapies and so can yours. The human body comes equipped by the Creator with amazing abilities to heal. Many factors can potentially interfere with these amazing abilities. This is why it is important to determine your ‘stop, start and change’ list. Your body can heal itself with some help and proper navigation – let me help you navigate your well-being journey. Health by Design, the name of my web and blog pages reflects how I designed my health using a variety of strategies. These are now all a part of my holistic protocol which you can find in my books and blog posts. Good health is an achievable goal. Get started on a healthier you today! Remember – small changes can have a big impact! While you implement my ‘stop, start and change’ holistic protocol consider adding natural symptom relief strategies to help you ride your wave of symptoms. My goals are now focused on achieving healthy longevity and sharing these strategies with clients, so stay tuned. Neuromuscularbiofeedback assessments throughout the years on multiple clients has provided a bounty of useful information to promote healthy longevity. Ongoing research provides additional insights. Ewe, what’s that smell? Learn how to restore your sense of smell to normal and safe! There was a time in the past that I would run the other direction when I picked up on a scent. It wouldn’t matter what the source, synthetic or natural. My olfactory bulb, the part of my brain responsible for how the body assesses and responds to scents, was seriously malfunctioning. The good news is that I have been able to restore my olfactory bulb and body’s normal way of detecting, assessing and responding to scents, even synthetic and harmful scents. You too can achieve this goal. The first step is to believe that it is possible. A heightened sense of smell or even loss of smell can be signs of TILT and body pollution. Before you work on desensitizing your offended olfactory bulb, follow my holistic protocol to completely detoxify your body – stop adding to your body pollution, and remove your existing body pollution. 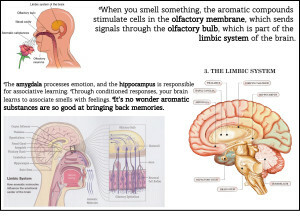 One of the most important steps in desensitizing your offended olfactory bulb is to gradually get used to natural scents. Start by inhaling natural citrus scents (oils pressed from the skin of fruit) from an inhaler or diffuser. An accurate sense of smell is important for a normal healthy body functions, including immune system function. Contact me to order your citrus essential oils. It is possible to recover from multiple chemical sensitivities! I have! How did I do it? Read my ebook MCS Gone. When your sense of smell becomes ‘skewed’ to the extent that you are running in the other direction whenever you pick up on a scent, it is the result of a previous injury probably caused by an exposure to a toxic chemicals. After an exposure to toxic chemicals the body and brain can lose it’s ability to tolerate even small amounts of chemicals, synthetic and natural. This is called toxicant induced loss of tolerance (TILT). Your resulting heightened sense of smell and offended olfactory bulb response can also be your body’s way of protecting you from re-exposure and allowing your body time to recover from the initial assault. As time goes on your body’s sense of smell should be restored to normal. If it is not restored it is time to look for solutions that will get you there. Why? If your body is regularly mounting hyper vigilant and skewed responses in one part of your body, there is probably additional malfunction in other parts of the body as well as compromised surveillance of situations that need attention. This can be a serious ongoing health challenge. Response – your operating system (body/mind) has directed your body/mind’s defense systems to take care of the real or perceived situation/threat. In step 2 of the process, when your body makes a judgement about the significance of the perceived awareness, your body and mind uses criteria from past experiences. For instance, if in the past you have been exposed to an excessive amount of smelly toxins, your body and mind may evaluate all scents in the present at a 10 out of 10, in terms of threat and harm, when they should be evaluated somewhere between 0 and 10. Is your body’s valuation for the threat of all scents a 10/10? The truth is all scents are not a 10/10 threat to you although your body and mind may think and believe so. If your body and mind does evaluate all scents at a 10/10, it could mount a skewed response based on the valuation; and send you into an allergic or sensitivity response or on the run. Changing the valuation that your body mind gives to scents will change the way your body responds to them and eventually your sense of smell with be restored to normal and you will be safe in the presence of scents. Keep in mind that nobody should remain in a location where there are toxic or harmful scents. Although I can walk by pefume counters now without my body going into a 10/10 valuation and threat response – I do not hang around them because I know that synthetic scents can be harmful to my health. Read my blog post FRAGRANCE: Oh How Sweet The Smell and How Potentially Dangerous To Your Health for more information. How do you change your body and mind’s threat evaluation from 10/10 to a normal 0-10/10 response? Besides past experiences become part of your body and mind’s criteria for present day responses, there are many other factors that can be responsible for the criteria your body and mind use to respond. Body pollution, memories of past trauma and stressors can also be a factors. Symptoms, including a skewed response to all scents, are just the ‘tip of the iceberg’. 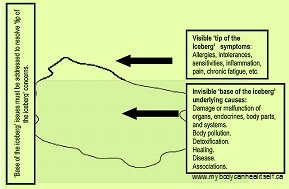 To alleviate symptoms, ‘base of the iceberg‘ issues must be resolved. You can find strategies to restore your body and mind’s way of responding to normal in my book THE WHOLE PERSON WELL-BEING EQUATION. Although this may sound impossible you can change your body’s valuation by continually reprogramming the value of any threat, real and perceived. Try this the next time you smell something (start with a scent that you know will not harm you but may have offended you – eg. smell of an orange). When you smell the orange immediate say in your mind ‘0’ (zer0), ‘0’, ‘0’. Then if your mind goes to ‘oh my gosh’, keep saying zero, zero, zero. Do this every time you smell something offensive and do not allow your mind to go to ‘oh my gosh’. Over time you will have changed your body and mind’s valuation of the perceived threat. Obviously, if the scent are coming from something toxic, you are going to move away from it while repeating. Are you living in a protective bubble? Is your life passing you by? Is it time to get back to your life and feel good? More ways to reprogram your body’s faulty responding – UPDATING OUTDATED BODY SOFTWARE: For Symptom Free Living. When you are ready to take the next step to help restore your body’s normal scent response contact me to order your essential oils and set up an in person BodyFeedback Interview & Therapy session. Attend a ‘environmentally safe for you’ workshop. 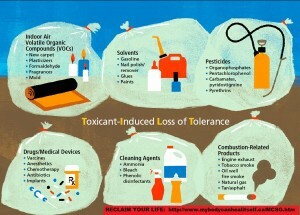 Toxicant Induced Loss of Tolerance (TILT) can lead to multiple chemical sensitivities (MCS). Each person diagnosed with TILT and MCS is unique and their condition comes with its own distinct equation. Your condition’s onset, history and progression shares many of the same ‘common denominators’ as another person’s, including mine. A common denominator is a commonly shared theme or trait; also a common element in a mathematical equation. In math class you learn to rewrite your math equations to change the answer. Are you offended by smells, synthetic and natural? Have you lost your sense of smell? There is a good change that you are suffering from Toxicant Induced Loss of Tolerance (TILT). 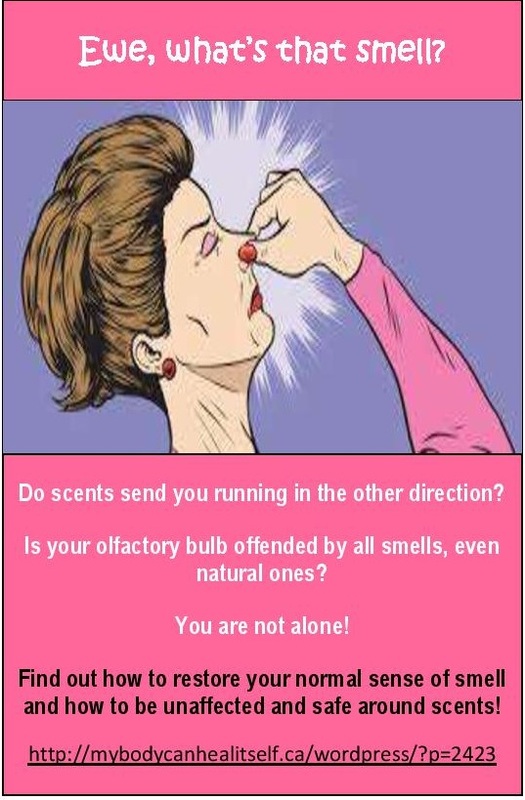 When your sense of smell becomes ‘skewed’ to the extent that you are running in the other direction whenever you pick up on a scent or if it has stopped working; it is the result of a previous injury probably caused by an exposure to a toxic chemicals. After an exposure to toxic chemicals the body and brain can lose their ability to tolerate even small amounts of chemicals, synthetic and natural or interpret smells at all. This is called toxicant induced loss of tolerance (TILT). Claudia Miller, a tenured Professor in Environmental and Occupational Medicine and Vice Chair of the Department of Family and Community Medicine of the University of Texas Health Science Center at San Antonio has studied this condition and treats it medically. You can read about her work in TILT at http://drclaudiamiller.com/. Learn how to restore your sense of smell to safe and normal. This is important for your overall health. One of the most important steps in desensitizing your offended olfactory bulb is to gradually get used to natural scents. Start by inhaling natural citrus scents (oils pressed from the skin of fruit) from an inhaler or diffuser. I can help you get started with the right dosage and best oils to restore your normal, healthy sense of smell – a necessary step for healthy longevity. An accurate sense of smell is important for a normal healthy body functions, including immune system function. to get started. Regardless of what your diagnosis or symptoms picture is, whole body detoxification, the right way, is an important first step. Get started today! Addressing your body pollution and detoxifying is an important first step for any health condition. This was in extremely important step for me in my recovery. Detoxification is a two step process: one – stop adding to your body pollution my cleaning up (greening) your personal care products, diet and environments; and two – remove your existing body pollution (we all have some). It took me a lot of trial and error to come up with the best detoxification method which I now recommend to my clients with great results. The complete instructions and recipe for the herbal detoxification baths that I used to recover from my health issues including my TILT can be found in my book THE WHOLE PERSON WELL-BEING EQUATION. Get started today on whole body detoxification the right way. Do you feel like you are living in a bubble and that there is no place outside of your bubble that is safe? 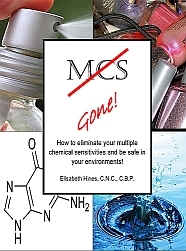 Do you suffer from multiple chemical sensitivities and environmental illness? If so you are not alone. There was a time when I lived in a ‘virtual bubble’ to protect myself from all of the chemicals that caused my body to react. Many years later, after much research and trial and error strategies I have escaped my bubble and can help you to escape yours as well. I can now feel safe in the world, go anywhere and eat anywhere, without fear or reacting. Yes, I still go with informed vigilance and protection because there are many harmful substances in the world that could potentially hurt me, and everyone else out there. Most people have a considerable quotient of well-being. For those whose health is challenged by a variety of daily symptoms and conditions, well-being can be elusive. My health journey has taken me through multiple health challenges. Symptom relief was a daily challenge for many years. For many people this is the case. The pre-occupation with extreme and chronic symptoms, and the search for symptom relief can leave little time to address ‘root causes’ of the symptoms, a must for health true recovery. Symptoms are like the ‘tip of the iceberg’. To achieve symptom free status you must deal with the underlying ‘base of the iceberg’ issues. Learn more here http://www.mybodycanhealitself.ca/AllergiesandIntolerances.htm . All of the above factors can cause damage or changes to the body’s original ‘software’ and body’s default settings, and subsequent way of responding. Software is the entire set of programs, procedures, and related documentation associated with a system and especially a computer system. Your body’s operating system is more complex than a high tech computer and comes equipped with preprogrammed criteria for responding, your software. In cases of multiple chemical sensitivities (MCS), allergies, toxicant loss of tolerance (TILT), heightened sense of smell, auto immune and other disorders; the body’s normal way of responding has been altered because the body’s software and body’s default settings have been altered by a major trauma, in my case it was the off gassing of a new house added to my body pollution. One of the resulting challenges was an overwhelming awareness and offense to the smell of all chemicals and scents, event in small amounts. A heightened offended sense of smell can also be an indicator of body pollution. BODY POLLUTION: Who Is Responsible? – http://mybodycanhealitself.ca/wordpress/?p=455. Synthetic fragrances comes with potentially harmful health risks. FRAGRANCE: Oh How Sweet The Smell and How Potentially Dangerous To Your Health – http://mybodycanhealitself.ca/wordpress/?p=1454. 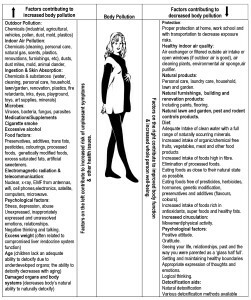 The challenge in major health challenges like those listed in the previous paragraph is to get your body to differentiate between scents and chemicals that really harm and those that you are simply fearful of. The body/mind can become very vigilant after a major trauma and initiate various ‘skewed’ responses, like a heighted olfactory response, in an attempt to protect you. Many people find that they are also offended and sometimes negatively affected by natural scents. Getting your body/mind to differentiate will allow you to live in the real world and not become a prisoner to your fears, diagnosed condition and it’s initial limitations. It will also allow you more recovery options, like therapeutic essential oil therapy, a safe solution for symptom relief. You can desensitize your heightened and offended sense of smell by smelling ‘safe for you’ (a practitioner who using neuromuscularbiofeedback testing can help determine these) daily doses of 100% pure therapeutic grade essential oils. What alters your body’s software? Alterations to your body’s software can be the result of a combination of physical, mental, emotional or spiritual assaults or reprogramming. These changes and the ability to restore original programming can be affected by what you have been told in a diagnosis and prognosis, acceptance of your situation, ownership of a diagnosis and prognosis (I have _______), what you believe, what you think, what you say and what you expect. Although I use the words allergies, MCS, depression, post-traumatic stress disorder, stress sensitization and spasmodic dysphonia when I relay my journey to improved health – I was always careful to say, my body is affected by these symptoms or conditions instead of ‘I have’ these conditions which denotes ownership. There was a time when I reacted every time I ate any food and was so afraid of every chemical and every smell because they offended me, and so I determined that they all hurt me. The truth is that many of the foods, chemicals and smells that I experienced were harmful or toxic to me because of my injury and did have a negative effect on my body. The reality was that there were also many chemicals (everything is made up of chemicals) and scents that although offensive to me were not hurting me. The ‘all or none’ thinking that person’s with MCS and other conditions experience is understandable. There was a time when MCS was considered a psychological condition, maybe the reason for that is the ‘all or none’ thinking that sufferers sometimes revert to protect themselves from further harm. How do you restore your body’s ‘software’ and normal way of responding? To restore your body’s software and normal way of responding it is important to update the software with corrections. The software on a computer requires regular updates to stay current. If your body has been responding in a ‘skewed’ fashion due to trauma – it’s time to update your body’s software. That is what I did to get my body to stop mounting ‘skewed responses’ and achieve symptom free living. It is important to continue with protection strategies and keep an open mind about what is possible, allowing your brain to update your software. This will require letting go of the ‘all or none’ thinking. Following are some strategies that were successful for me that you can use to help you to update your body’s altered software and way of responding. Although I am offended and affected by many chemicals and scents, I am not negatively affected by all chemicals and scents. Although some foods cause me to feel unwell, making me suspicious of many foods, there are foods that are safe for me to eat. Although my body has been reacting with ‘skewed responses’ at times, I know that my body can and does respond normally as well. Although I have been told that there is no cure for my condition and nothing can be done, I know that my body can heal itself and restore normal responding. Your complex body was created with many amazing abilities. Every moment of every day, without any action on your part hundreds of processes are taking place and abilities are available to you, even while you are asleep. The healthy human organism, with its complex high-tech operating system, is continually self-detecting, self-diagnosing, self-renewing, self-healing, self-repairing, self-cleaning and self-protecting. The body has an internal pharmacy, which when functioning properly produces natural analgesic, anti-depressant, anti-anxiety, anti-stress, sleep-inducing, immune system strengthening and gastrointestinal normalizing chemicals. Many of the body’s processes and abilities are automatic and are often taken for granted. There are many factors that can interfere with these normal processes and abilities. It is your responsibility to understand and protect these abilities and the internal communications required to ensure they function normally. 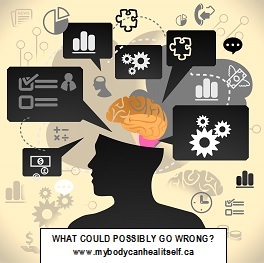 You can learn how in my book THE WHOLE PERSON WELL-BEING EQUATION, my website www.mybodycanhealitself.ca and my blog http://mybodycanhealitself.ca/wordpress . This does not mean you should stop seeing your doctor. He or she is the person you consult for additional assistance and assessments. Clinic for Mind Body Medicine, Alberta Health Services, http://www.calgaryhealthregion.ca/programs/cmbm/journey.htm, 2009. A NEW OPPORTUNITY FOR ‘a healthier you’! Every day brings a new opportunity for ‘a healthier you’. But where do you begin? What do you need to ‘stop, start and change’ for a healthier you? Have you made decisions and tried strategies in the past in your quest for better health? When I work with clients I provide them with a STOP, START and CHANGE list based on the information they provide me with about their lifestyle and diet, and the information from their weak list assessment from the BODYFEEDBACK INTERVIEW AND THERAPY SESSIONS that I provide. With this information clients are usually presently surprised that they start to feel better and people start to comment that they look healthier after they begin implementing the STOP, START and CHANGE list. . Find out more by reading THE WEAK LIST: A Necessary Well-being Tool at http://mybodycanhealitself.ca/wordpress/?p=74. 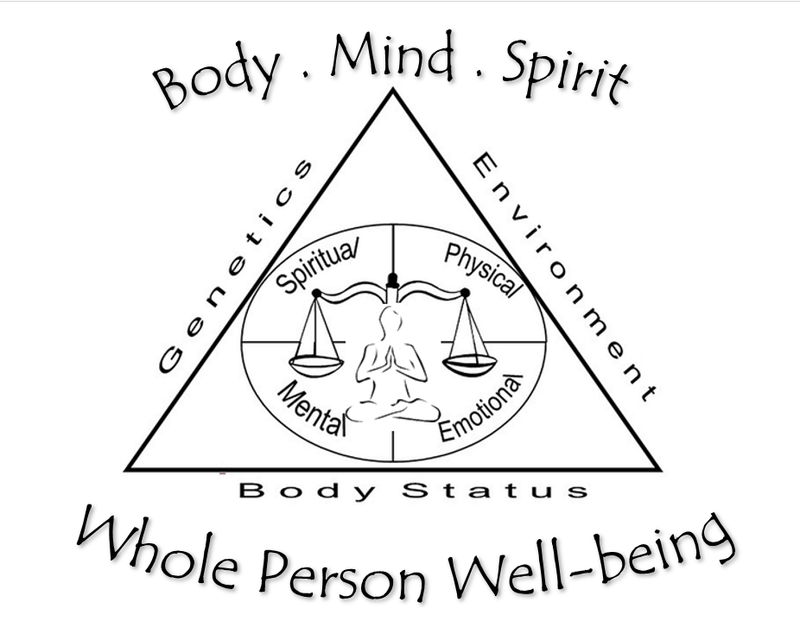 Clients receive a copy of my book THE WHOLE PERSON WELL-BEING EQUATION which includes my holistic protocol and helps clients keep on track with their well-being goals. The book contains information on lifestyle changes and natural self help therapies and tools for improved health. You can purchase the book by clicking on the link above. 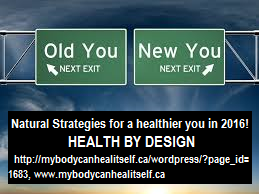 My blog HEALH BY DESIGN For A Healthier You for ongoing posts on lifestyle strategies that will help them to achieve greater well-being, symptom free status and healthy longevity. Staying up to date on the latest research on challenges to and strategies for healthy longevity is key by following social media pages. Wishing you a healthy longevity! Implementing positive changes in your life can transform your health. According to ‘the butterfly principle’ seemingly insignificant choices cause changes which lead to significant outcomes. Any changes you make in your present way of thinking, living and being have the potential to lead to significant improvements in your health and life. Butterflies represent the ultimate change possible. 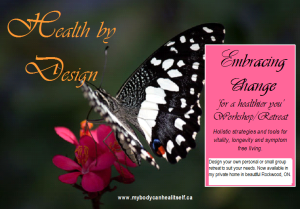 Although you have missed the opportunity to attend the Embracing Change Retreat at the Butterfly Conservatory on September 27 & 28 – you have the opportunity to experience the same type of retreat at my personal residence in beautiful Rockwood, Ontario. Retreats are customized based on what you would like to learn or work towards for your ‘healthier you’. teach you the basics of muscle response testing MRT for protection (for newcomers) and neuromuscular biofeedback NMBF used in BodyFeedback™ Interview & Therapy to determine your ‘weak list‘, and assess your body’s health status (for experienced muscle response testing users) using my protocol and resources (anatomy, physiology, biochemistry, etc). For those of you who know MRT this is a great opportunity to take it a step further and learn how to assess your own body status daily. Regardless of what your diagnosis or prognosis is/are, learning and using MRT and NMBF can be lifesaving. It was for me and has been for my clients. It provides you with crucial information on a daily basis, allowing you to avoid any harmful factors (determining your weak list); allowing your body to focus it’s energies on healing and repair instead of vigilance and reacting. This workshop can change your life! All participants will receive a daily BodyFeedback Interview & Therapy session. Listen to Mary’s testimonials (1, 2). If you are thinking about coming – come with an open mind. Your body has many amazing abilities, often forgotten or misunderstood, that have the potential to ‘change your life’! You have more to gain than lose! Let me show you how to transform your health outcome! What do you believe is possible in terms of ‘a healthier you’? This workshop can help you change what you believe is possible and provide you with the information and skills to make it doable for you. Please check with your healthcare practitioner (There may be contraindications due to health status, age, medications or other factors) before submitting your commitment to attend. NOTICE: This is a NO SCENT ENVIRONMENT event. Synthetic scents contain neurotoxins that interfere with muscle response testing and neuromuscular biofeedback. If you regularly use any of these synthetic scents (perfumes, air fresheners, scented candles, scented laundry or fabric softeners and scented body care products) stop using them for this event and for the sake of your health. Use 2 cups of baking soda to soak your clothing in overnight and then wash with an unscented natural laundry detergent and natural fabric softener. Daily – BodyFeedback™ Interview & Therapy Session to determine your ‘weak list ‘and to help restore balance, normal healthy responses and defaults. An incredible opportunity to become ‘a healthier you’ in the presence of ‘like minded’ people in a safe environment ( I will be your personal ‘body guard’ – I know how terrifying it can be to take this step – I have been there). Gerda Hammond commented on an upcoming retreat: “Looking forward to the workshop! Manifesting change in my life started with letting go of old beliefs and embracing new ways of thinking. Doing things differently, I am becoming a truer version of myself. Believing in the power of my body to heal itself has been difficult, but knowing power is not equal to force, changes everything. By observing nature and intuitions, life flows. I would recommend you take the step to opening your mind to changing the way you look at life and be part of the upcoming workshop. You can have a healthier and more fulfilling life, but it requires making a conscious decision to move forward in a different unconventional direction. You are in the drivers seat and Elisabeth Hines will help you with your journey to well being one step at a time. Regardless of your challenges, this workshop will give you something to think about and hopefully give you the courage to move forward to joyful living”. Private and small group (6) retreats are available. Price depends on content, length of stay and number of people. Private bedroom and bath and shared bedroom and bath options are available. Please email me at elisabethlhines@gmail.com with your desired retreat design and I will provide you with a quote. GO GREEN HEALTHY BODY AND BEAUTY girls sleepover weekends. These casual hands on ‘learn, make and take’ get togethers will provide you with the tools you need for ‘a healthier you’, from the inside out and the outside in. Book a private one on one weekend or a group of friends. The Go Green Healthy Body and Beauty workshops can be customized to suit your needs/desires.